When you know how to meditate for happiness you’ll be able to make yourself feel great time and again. There are so many reasons why meditation makes you happy. And it all begins with happiness itself. Have you ever wondered why it’s so hard to be happy? So many people struggle to let themselves be happy. They fight against happiness, like they actually want to be miserable. Or some other rubbish demand you put on yourself? Listen: You deserve to be happy now. It can be hard to be happy. Meditation, however, can help, big time. Thankfully there are some powerful meditation techniques for happiness. Science proves that there meditation techniques make you happy (here’s the reason why). And there are other exercises for happiness too, such as these happy-hobbies. There are so many reasons to start using meditation techniques for happiness. Mostly because meditation makes happiness easy. When you use meditation techniques for happiness you silence all those negative thoughts and worries—you know, all the things that stop you being happy, and you find inner peace. Then, happiness comes easily. The 2016 Happiness Index is sitting at a pathetic 31 out of 100.That’s less than one third optimum happiness. But we can change this. Let me show you how to meditate for happiness. If you want to know how to meditate for happiness, start by opening your mind by focusing on the present moment. Focus generally on the present moment (like when we do open monitoring meditation). Focus on one single aspect of the present moment. 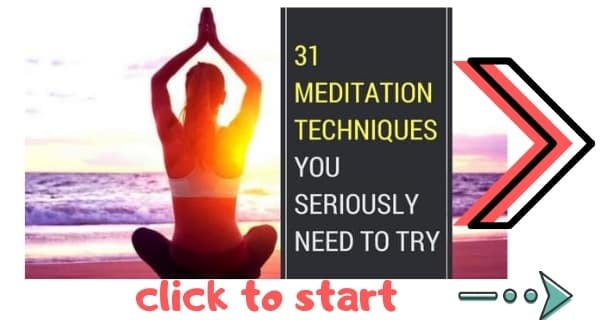 *For guides to all these techniques read: The 31 Top Meditation Techniques. Arguably the very best meditation technique for happiness is Vipassana. Vipassana is essentially the practice of monitoring and labelling your thoughts and emotions. It’s one of the main Buddhist meditations and it is scientifically proven to make you happier. Do you ever find that when you try to be happy you feel anxious or depressed or some other negative feeling? If so, Vipassana will help. It will give you more control over your emotions so you’re less affected by negative feelings. Plus, when you practice Vipassana you’ll be more aware of the 16 different types of happiness. Remember to read the link above to learn this another other meditation techniques. Loving Kindness Meditation is a technique in which we visualize the giving and receiving of compassion. 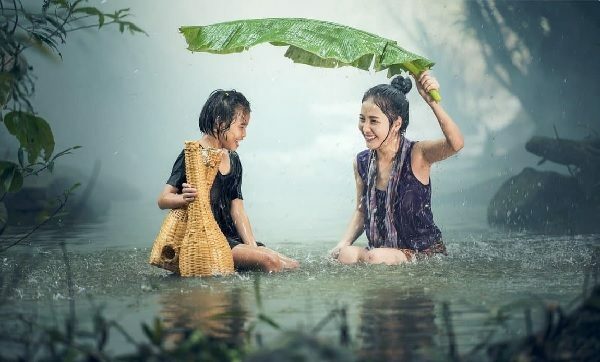 Neuroimaging scans show that Loving Kindness Meditation changes the structure of the brain and increases arm feelings like kindness, love, compassion, and happiness. Pratyahara is actually a type of yoga. It is a method through which we eliminate the negative influence in our lives and increase the positive influences. This tips the scales in favor of happiness and removes causes of unhappiness. Do you experience a lot of negative thoughts? If so you should definitely try Mindfulness-Based-Cognitive-Behavioral Therapy. It’s a method used by therapists to target and change problematic thoughts. You can use these techniques for positive thinking. Mantras are specific words or phrases with spiritual properties (they are similar to affirmations or spells, but are backed by science and have been used for thousands of years). Meditating on a mantra relaxes the mind and induces specific states of consciousness. There are specific mantras for happiness. Meditate on these mantra for 10 minutes and you will notice an improvement in mood. So here’s the problem where most people struggle. How in the hell do you let go? I mean, it’s not like we’re talking about holding a physical weight now, is it? If you were holding on to a weight you could just set it down on the table and bingo, problem solved. But you can’t just let go of mental attachments, can you? You can’t let go of your ex. You can’t let go of your old job. You can’t let go of your past. You can’t let go of your deceased family members (something I had to learn to do myself). You can’t let go because you’re not actually holding on to anything. You’re holding on to a weight that exists only in your mind. So how on Earth do you let go of that? Well, let’s think about it in terms of letting go of something that does have a physical existence. If you were trying to let go of a weight, what would you do? You would loosen your grip. Gravity would take over. And gravity would bring the weight to the floor so you don’t have to carry it anymore. So when you let go there are two things involved. There’s your grip and there’s reality. And if you want to let go of something in your mind you also have to let go of your grip and you also have to let gravity take it. One half of that is a lot easier than the other half. It’s a lot easier to let go of your grip than to let gravity take it, because what on Earth is mental gravity? We’ll deal with that in a sec. We know that unhappiness is caused by holding on too tightly. We know that pain / suffering begins when we hold on to something that is changing, because our minds and reality are pulling in opposite directions. And we know that to be happy we should let go and trust life. There was also something about gravity…? We’ll get to that. For now we need to let go of our mental grip. To let go we meditate. All the best meditation techniques for happiness help you to let go of that baggage. So let met show you how to let go by meditating. This is a quick meditation technique for happiness. It will take five to ten minutes and I promise you that you will be very glad that you did it. Get comfortable in a relaxing space. Close your eyes and focus your mind on your breathing for a few minutes (use these breathing meditations for the best experience). Continue to focus on your breath. Thoughts will arise in your mind. The trick here is to simply observe them. Do not fight them. Do not try to repress them. And do not attach to them. Just observe them and let them go when they go. Continue observing your thoughts and tell yourself that they are only thoughts. See the true nature of them. See that your thoughts are not real they’re just like little smog clouds that arise in your mind. This will loosen your grips on your thoughts, which is step one of finding happiness. Believe it or not, there is a mental “gravity” and it works in the same way that gravity works. Gravity works by creating a force to which objects are attracted. Planets create gravity. And because of that we are pull towards the ground. Your mind is also pulled towards the ground. The ground is reality. Like regular gravity, mental gravity pulls you towards reality. We’re also ways being pulled towards the way things are. We are mentally pulled towards reality. When you go through bad breakup, for instance, you are pulled towards accepting the breakup. But (and it is a very big but) we have the power to resist gravity. Just like your muscles can pull a weight against gravity, your mind can pull against reality. And just like with your muscles, if you pull too hard you will suffer, you will be injured, and you will be unhappy. And that is the entire nature of unhappiness. Does it seem funny that your mind works in the same way that your muscles work? Your muscles can simply exist in the state they’re naturally meant to be in. When you just let your muscles do what they’re supposed to do you will be healthy and your muscles will be happy. And when you let your mind exist as it should your mind will be healthy and happy too. But how do you let your mind simply exist in the state it is supposed to be in? So far we have used meditation to let go of our grip (by loosening our thoughts). Now we need to let go and let gravity take its course. Essentially, we need to let things exist in the natural order. This is step 2. As before, take yourself somewhere peaceful and relaxing. Now you are going to let gravity take over. And the way to do this is by being mindful of your senses. So, begin to focus on each of your senses. Meditate on taste, touch, smell, sound, ad sigh. And then meditate on your own body. Pass your focus around your body, being aware of all the sensations you are experiencing. Continue to meditate in this fashion as you take 108 breaths. Open your eyes and continue to be mindful (to focus on reality). This will let reality (gravity) take over and it will make you very happy. If you have performed both those meditations you will be feeling very, very relaxed and incredibly happy. And if you haven’t actually done the meditations yet, go ahead, do them now. I promise you they will make you feel amazing. One last thing: if it feels like you are putting yourself first by focusing on your own happiness: Good! You should put yourself first. And always remember, you do not need to be happy always.